Sorry I am late posting today. I’ve been furiously searching for information about an awesome bug that I saw this morning. While walking the dog this morning, I saw what appeared to be a young blade of grass flung up by a lawnmower and now stuck to dew on a black lamp post. Perhaps because it was at eye level, the grass clearly hadn’t been mowed recently, and it was a brighter green than I would expect a severed blade to be, the bright green sliver caught my attention. Had it been a few feet closer to the earth, it would have gone completely unnoticed. Pretty clever disguise for the manicured landscapes of the suburbs if you ask me. Too far away from home (i.e. the camera) and too much of a nature lover to pick the little guy up and remove him from his habitat, I returned home and searched entomology databases for “walking grass,” because it seemed so similar to a “walking stick” bug. The closest image I could find is above (thanks to NicksSpiders.com/insects). So far, all I have deduced that the bug is of the order Exopterygota or Plasmida or both but that doesn’t mean a whole lot to me. Perhaps it is just a young “walking stick” bug and, like a new branch on a tree, it begins life this bright color? 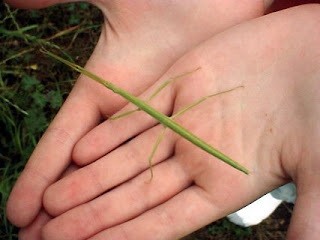 But the little creature I saw, and the one pictured above, both seem to have only four legs, where walking sticks have six. Not to mention, the mystery lamp post bug was less than half of the size of the one pictured above and no thicker than a blade of grass. Can anyone identify this mystery bug? Paul Roberts, author of The End of Oil and The End of Food recently wrote a great essay for Slate: Food Fight: The four barriers to the genetically modified–food revolution—and why no one is talking about them. He addresses the fact that genetic modification (GM for short) research is focused on “Western cash crops,” corn and soy, instead of crops that are truly relevant to global food security. Also addressed: seed saving, the expense of the GM seeds and the technology required to develop them, the politics involved, and other global and public concerns. The Sunday NY Times published a great article about big retail chains installing solar panels on the roofs of their stores. Whether it’s to help bring energy costs down or for the tax break, let’s hope this renewable energy trend continues to grow momentum. Right now, Kohl’s has solar panels on 43 stores and plans to add them to an additional 85 in the coming months. Macy’s currently has 18 installed and 40 on the way. Wal-Mart is tesing the technology in 17 stores. Safeway and Whole Foods are also supporting these energy-saving initiatives. Organic versus Natural: What’s the difference? The term “organic” suggests that a botanical product was grown in an environment free of chemicals, fertilizer and pesticides. Chemical products are replaced by natural ones making the organic item bio-compatible with our bodies, more readily absorbed. The final product must be at least 95% organic in order for it to receive the Certified Organic stamp of approval. 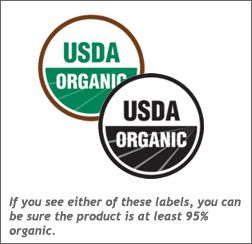 The Certified Organic label also assures that the producer passes regular inspections of their facilities, ingredients and practices as well as pays a fee for the certification. Some products will boast that they are “made with organic ingredients.” This means that at least 70% of the material used is organic. The other 30% (or 5%) may or may not include additives and preservatives. Author DeborahPosted on August 11, 2008 Categories certified organic, natural, organicLeave a comment on Organic versus Natural: What’s the difference? The Green Revolution, while it produced incredible yeilds or grain and rice, depended on mono-cropping and replaced local varieties with what ever American agribusiness dictated. Production soared and so did pests. Run-off from pesticides and chemical fertilizers poisoned the water and soil in regions of India causing cancer rates to shoot sky high. Dubbed “India’s new nonviolent revolution,” Punjabi farmers embracing natural farming techniques and attending Umendra Dutt’s workshop are taking back land, health, and freedom. Kamdar writes about the workshop that educates farmers on natural and effective solutions to the two main hurdles in Punjab agriculture: water scarcity and pesticide poisoning. Keep your eye on this revolution folks. “Punjab is a microcosm of the success and the failure of industrial agriculture in the developing world. There is no doubt that, with enough water and enough chemicals, privileging production above all else can boost yields dramatically. But the damage to the land and the people that make that production possible is profound. It is a model that is not sustainable, as a report published this spring by the International Assessment of Agricultural Knowledge, Science and Technology for Development, a joint effort of the World Bank and various U.N. agencies, so strongly argued. Ultimately, it will fail. It is failing now, just as the world is desperate to find a way to feed a growing population in a time of climate uncertainty and resource scarcity. 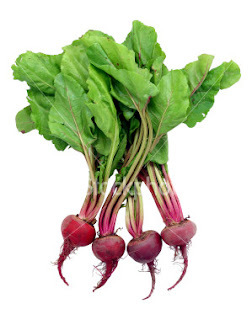 Martha Rose Shulman, of the NY Times, has published another yummy recipe for beets – this one with risotto. Mmmm…. I’m not usually one to jump on the nutritionism train, but I trust NY Times blogger Tara Parker-Pope and if she is posting about the benefits of beets (high in folate, manganese and potassium) I might just have to roast some up. *Orthorexia – From the greek “ortho” (right and correct) and “exia” (appetite) . American physician Steven Bratman first proposed the term in 1996 and while it is not yet an eating disorder recognized by DSM but, all of this according to Michael Pollan in In Defense of Food, an academic investigation is underway. Don’t get me wrong, I’m not a big fan of the fast food industry (thanks to Fast Food Nation, among others), I’m just wondering if this is the best approach to help control the obesity epidemic or if the LA City Council members are a little high on protein and perfection. Of course the bigger hope is, like in Concord, Massachusetts a few years back, that such restrictions will boost traffic and sales at local grocers, diminish truancy, decrease pollution and improve these communities but I guess, well, I can’t help but picture Britney Spears chaining herself to the local Sonic (I know I know, “leave Britney alone”). What I am trying to say is, obesity is a symptom of a much larger problem: the industrialization of food gone wild. Another symptom on the opposite end of the spectrum: famine and starvation in other parts of the world. Oh Lord… am I an orthorexic? Author DeborahPosted on August 7, 2008 Categories Michael Pollan, obesity, OrthorexicLeave a comment on Orthorexic? I am hoping to come up with a word for individuals who exhibit environmentally friendly practices in both their home and personal lives. 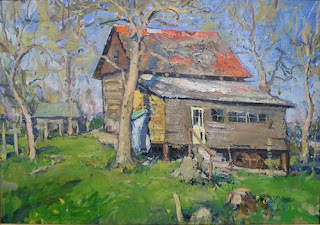 David Wase, owner and president of Metropolitan Gallery (formerly Claren Court Studio) in nearby Arlington, VA is one of those people. David recently sent me the press release below and given my affinity for fine art and the careful preservation of it through fine framing, I couldn’t be happier to read the news. Outside of work, Wase, his wife, Susan, and their two dogs (CJ and Teddy) grow all their own veggies. If you have driven around the Arlington area, you will know that this is no small feat: Land is hard to come by. The Wase’s dedicate the majority of their front and back yard to vegetable, fruit, herb and native gardening. I love hearing about folks like this! We now have eco-friendly picture frames, made from renewable-resource bamboo. This is a significant development since its use can reduce the pressure on rain-forest environments and South American, Phillipine and other de-forestation susceptible locales. Providing low carbon impact, these frames are finished in natural stains; (they are NOT available in gold or silver or other metallics which require use ot toxic metals and environmentally-unfriendly chemicals in their finishes). We are trying to source recycled mat board material also, but our primary concern is preservation and safety of all materials used in our framing. Currrently our matting material is made either from purified wood-pulp materials or cotton fiber which is annually renewable. To achieve maximum safety and preservation we have selected proprietary-technology Artcare products made by Nielsen-Bainbridge Corp, a leader in museum preservation technology. Artcare provides matting and mounting products that are the next generation in museum-quality conservation. They are so advanced, they redefine the field. For the first time in history, conservation framing has moved from the passive protection of the past— which, simply, does no harm—to the active protection of the future: Artcare proactively traps and neutralizes pollutants and acid by-products that damage’ artwork. The patented technology is engineered into the very fibers of Artcare products, and offers a level of conservation for treasured artwork beyond any other mounting or matting product.